In my 8 years of teaching I have never seen students so excited and engaged. They run up to me in the halls to tell me what they plan to do next class. They draw pictures about the game in art. They sit at the lunch tables and strategize their next building projects. And not only the boys, but girls too. Joel Levin teaches computer classes at a private school in New York City. Each day, groups of primarily first- and second-graders visit Levin’s computer lab to learn technology skills and digital literacy. In January of 2011, Levin decided to create a unit that used the computer game Minecraft as a teaching and learning tool. Minecraft is a civilization-building game that allows players to explore worlds, collect resources, and build anything they can imagine–both independently and collaboratively. Levin’s Minecraft unit was a huge success. Students were more excited than he had seen them before. He realized he could teach all the skills targeted by the class curriculum using Minecraft as the primary tool. You can take a fascinating tour of Levin’s Minecraft-based classroom in this video from Kotaku, also linked in screenshot to the right. In order to document the transformation of his computer lab into a Minecraft-based classroom and to share ideas with other teachers interested in using Minecraft as a teaching and learning tool, Levin created MinecraftTeacher.net along with the MinecraftTeachr’s YouTube Channel. He regularly publishes blog posts and videos in which he highlights classroom practice. 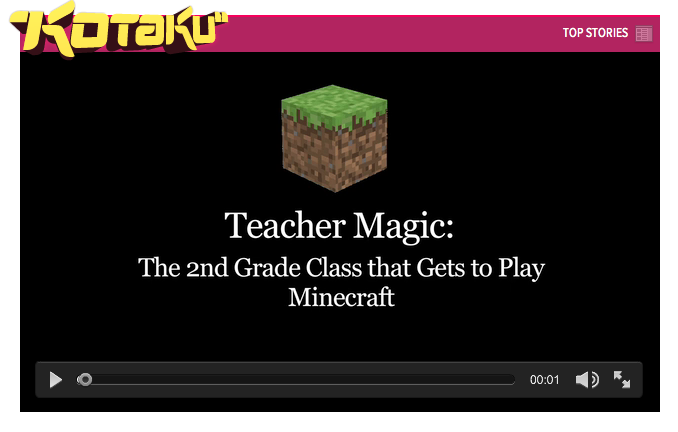 In the Teaching Minecraft video series on the MinecraftTeacher’s YouTube Channel, Levin shares student work, lessons and activities, and discusses curriculum related to the Minecraft-based classroom. Elementary Minecraft Episodes The Elementary Minecraft video series on the MinecraftTeachr’s YouTube Channel is for people completely unfamiliar with Minecraft. Levin uses these episodes to show viewers how to play. He adds complexity with each episode, including guidance on how to run a Minecraft server.